This racecourse, located in Sapporo City, the largest city on the northern island of Hokkaido, has two race meetings each year. 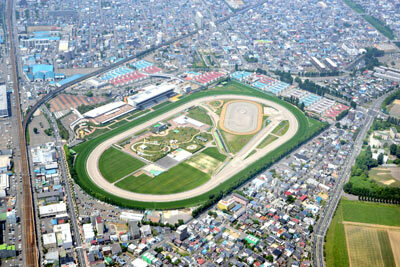 (Each race meeting usually has six to twelve days.) The major races are the Sapporo Kinen (G2), the Queen Stakes (G3), the Keeneland Cup (G3), the Sapporo Nisai Stakes (G3) and the Elm Stakes (G3). The refurbishment of the grandstand was completed in July 2014. Approx. 10 minutes on foot from JR Soen Station. Approx. 15 minutes on foot from Sapporo Municipal SubwayTozai Line Nijuyonken Station. Get off at JR Bus (No. 52 Line) "Keibajo Seimon Mae" (Racecourse Main Gate) bus stop.